Today I attended the St Albans School Forum on Education 2017. The general theme of the conference was around Learning Relationships and all the keynotes and seminars were designed around this, with a fantastic wide range of approaches taken. I wanted to run through, very briefly, what I saw and what I took away. Mike Grenier, Director of CPD at Eton and proponent of the Slow Education movement, opened with a talk based around Slow Education, the idea that how children learn is as important as (or more important than) targets and tests. Mike spoke about Noam Chomsky’s grammatically correct but semantically nonsensical sentence “colorless green ideas sleep furiously”, with some fabulous attempts at identifying meaning from the audience and one member furiously conveying the fact that it was just a nonsense sentence and deliberately so. It allowed Mike to allude to the idea that we do not give students enough time to, I forget the exact phrase, wrestle with ideas and spend time thinking as we are often so pressurised into learning the necessary information for the tests. Professor Sophie Scott, a researcher in neuroscience at UCL, comic, TED-talker and all-round science superstar provided an entertaining talk on the science of laughter. This had the natural focus of relationships as Sophie explained that laughter is the only known positive sound that is recognised cross-culturally (many negative sounds are cross-culturally recognised); it can truly pull people together. We were treated to some audio of laughter, showing just how odd the sounds and expressions are, and the classic Aggers and Brian Johnston ‘legover’ moment. This demonstrated that laughter can be indicative of the strength of and happiness within a relationship: the stronger/happier, the more those in the relationship will laugh together. This was also shown by those moments where something almost disastrous happens. The example Sophie gave us was of two people asking a music video that involved flipping into a swimming pool with a layer of ice. The flip should have broken the ice but failed to, and the camera-holder naturally burst into laughter and moments later the poor ice-flipper eventually caught onto the contagion of laughter, having realised he hadn’t broken himself, and shared the moment; bringing them closer together. Dr Jill Berry, the 30-years experienced in teaching and SASFE veteran (she’s spoken at 100% of all SASFE events…both of them), spoke about leadership and its importance in developing and maintaining effective learning relationships. Whether you’re a classroom teacher, leading the learning of the many children in front of you, or are a middle or senior leader, you have an important role to play in setting that culture and environment that enables these relationships to thrive. Jill spoke with her usual authority about what demonstrates good leadership, including a number of ideas provided from research that made us all think. Jill helpfully gave us some time to think and reflect on what she was saying, though I may have lowered the tone with my question about how to handle situations where a colleague has no interest in learning new things (I’m sure we all thought we should ask the question!) Something that will resonate with me in Jill’s response was that it was an abdication of responsibility not to take some action – starting with support, but potentially ending with, and I quote from some research in one of Jill’s slide, us having to “counsel out” the aforementioned colleague. Thought-provoking final keynote speech and I always love to hear Jill speak. Dawn Cox, quite probably the most modest person I have ever met, and RS teacher, ran a wonderful workshop on evidence-informed initiatives and the impact on learning. We were encouraged to discuss and question each other on initiatives that had really missed the mark and had little evidence behind them: learning styles and overuse of lesson objectives featured heavily. We spoke about how easy it is to accept ITT-learned ideas as fact because you are so busy in the training year to critically evaluate everything thrown at you. Dawn then spoke about the initiative that she has developed that is soaked in evidence from research; she calls it the Principles for Learning. Sorry about the horrendous slide quality. 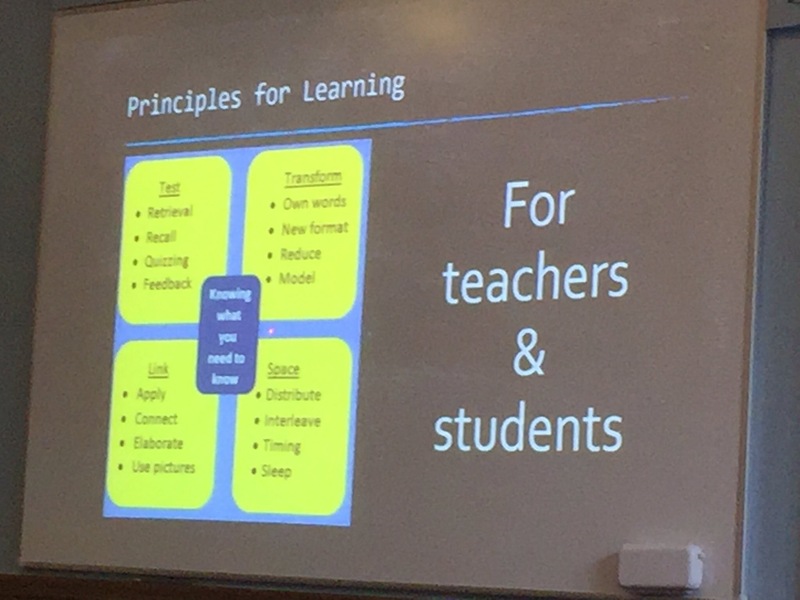 There are four principles: test, transform, link and space and the idea is that teachers embed this in their practice but, importantly, that students also spend time understanding the principles and how they should use them to benefit them. We started the session by voicing frustration at being asked to teach in certain unevidenced ways, but Dawn cleverly finished with the question, along the lines of, “Are we ok with teaching in a prescribed way based on evidence?” No easy answer. Greg Hacksley, the Head of Sixth Form at St Albans Boys School, had four of his sixth formers with him in a session entitled ‘How do I learn?’ The students opened by talking about how they each learned best, including some discussions on homework and how they learn in diffferent subjects and environments. Greg then asked a number of probing questions, and took a series of questions from the audience, that the students responded to. It was incredibly insightful: rarely do you have an opportunity to sit for 40 minutes with four of your students to talk about what helps them learn best. It showed that there was perhaps a divide between the best approaches in the scientific subjects compared with the humanities, but it did outline – as you might expect – that students have a lot of different factors that motivate and enthuse them and that we need to vary what we do if we want to keep everyone engaged and learning at their best. Whilst cognitive science can give us an idea about how learning occurs, scientifically speaking, in the brain, it doesn’t consider the many factors that influence motivation and engagement in our students. Mikey Smyth, the hero and organiser of the conference, enthusiastically bounded around throughout and seemed to enjoy waving his ‘5 minutes’ sign around when everyone was mid-flow in the seminar sessions. One development from last year was that he had designed the day with a greater length of time for the break and lunch and, as is often the case, these moments were filled with some good laughs and networking. I enjoyed finally meeting Shirley Drummond, Matt Pinkett (whose popular session ‘Questioning Masculinity’ can be found online here) and Dan Sabato, and spent many moments with Andy Tickner trying to dissect everything we were hearing. Somehow, we had independently chosen identical sessions. And all the other lovely people I spoke to that I haven’t mentioned, thanks for making #SASFE17 such a good one. What did I take from today? – Slow things down: educating, actual teaching the love of a subject, is important and tests are a necessary evil. I think my current Science Department, and School, helps with this because we want to enjoy teaching and are always looking out for solutions to any time pressures. – Leadership is a lot about integrity, believing in something and consistently pushing for it – not destructively, but to unashamedly believe. I want to be more comfortable in this, and I want to keep challenging myself in leading. I know I can do more and do it differently, I want to spend specific time on this considering what I can do and doing some more reading. We spend a lot of time in schools on teaching and learning, but leaders tend to spend a tiny fraction of their time on learning about leading. – Laughter is really quite important. Learning relationships with students (and staff) ought to involve some joy, not simply a functional relationship for learning some facts. – Whilst cognitive science gives us some very helpful understanding of how the brain works, we need to remember that there are so many factors at play that affect intrinsic and extrinsic motivation and the engagement of our students. It’s complex. Drew, this is a very thoughtful and insightful reflection of the day, and I am even more impressed that you have already written this blog! There was certainly so much to take in today and thankfully it was launched by Mike’s keynote ‘Slow Learning’ which I am embracing. I am grateful to the theme of this year ‘Learning Relationships’ and glad that the journey of learning for me is continuing with more new connections and relationships being formed. Great to finally meet you today! Good to read this, Drew – and you didn’t lower the tone at all!